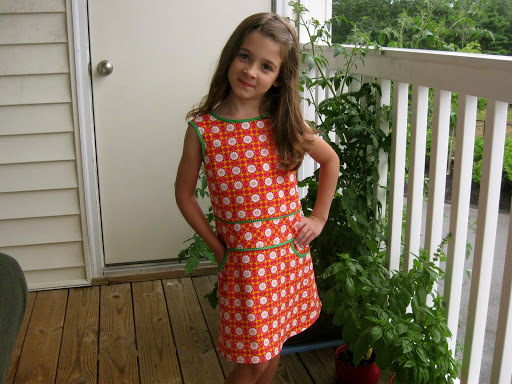 after inserting the zipper and finishing the bias bound neckline and hemming, the “go-go pick a daisy” dress is finished! i’m very pleased with how this turned out, it’s a simple silhouette that really shows off a cute fabric. i’m sure this one will get plenty of use! 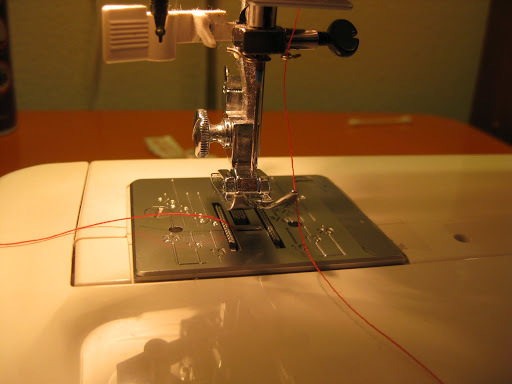 first, thread your machine as usual and draw up the bobbin thread as usual. and thread the bobbin thread through the needle going from the back. and wind the thread spool back until the knot it up to the spool. you want to make sure you have enough thread clearance so you can sew one dart without the knot making it to the needle. now, sew the dart starting at the tip of the dart. make sure your first stitch lands in the fabric. 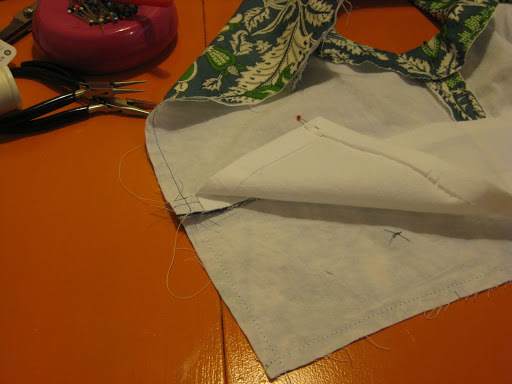 sew as usual all the way to the outside edge of the dart, reducing your stitch length as you near the edge. reducing your stitch length makes it so there is no need to tie off your threads as they are likely being sewn into a seam anyway. 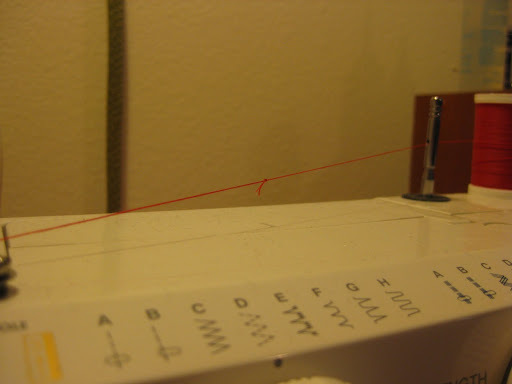 cut threads and re-thread the needle as before to sew the next dart! how cool is that? it’s called the couture dart but really there’s nothing fancy about it. i generally hate sewing darts but learning this technique just made it a little more fun! next up on my sewing table is an outfit for my 7 yr old. 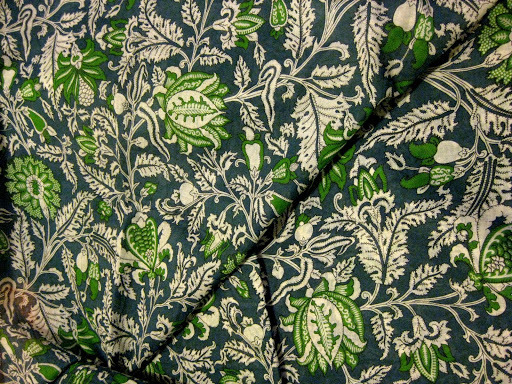 i was ordering some inexpensive clearance fabrics for a few summer dresses and i picked up this cute little cotton print. it’s one of those fancy organic cotton fabrics. 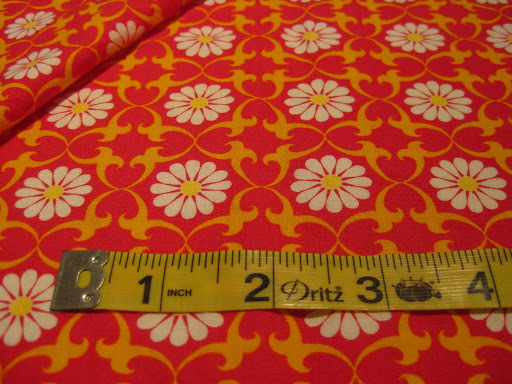 i was kinda hoping to be terribly unimpressed by it because it’s more expensive per yard than what i usually buy… but it was just so gosh darned cute. as luck would have it, the fabric is adorable and super soft. grrr… i hate it when i like expensive things… i only bought a yard because i was planning to make a skirt but i’ve managed to eeek out a little shift dress instead. 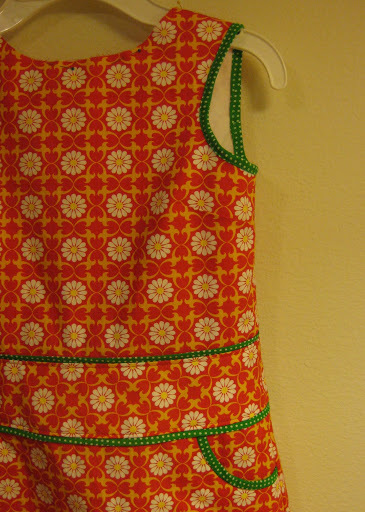 i’m calling it the “go-go pick a daisy” dress. aren’t i clever? i was too cheap to go buy a pattern, so i frankensteined (yes, it’s a word… maybe) together a few pattern pieces in my stash, graded them to be the right size, traced, re-traced, tissue-fitted… i think i pulled this one off. it’s supposed to look something like this. aside from the super cute print, what will really pull this dress together is the finishing. now, usually i’m too lazy or just too caught up in the sewing to think about trims and bias tape and lace and whatnot. but, i’m working on my embellishment skills and i thought this dress would be adorable with a few bias tape details. 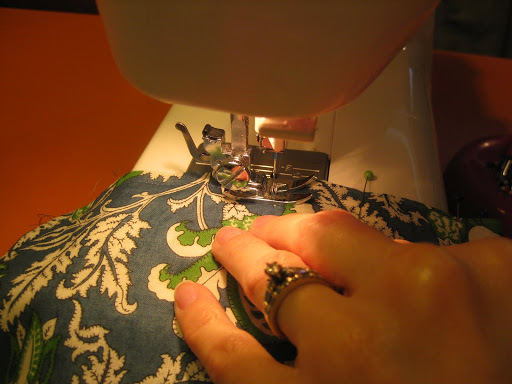 i am adding flat piping at the waistband seams and bias trim around the pockets, armholes and neckline. 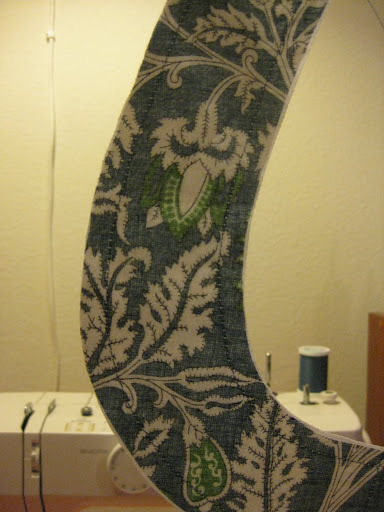 first up, flat piping… i started out by making several yards of bias tape. if you’ve never worked with bias tape before i suggest taking the easy way out and buying it pre-made. my own tape isn’t perfectly even so to make sure it turns out as even as possible pin single folded bias tape (if you have double folded bias tape just press it flat so it is only folded once) to the waistband and measure up to the folded edge to keep it straight. then, machine baste it in place. once the tape is in place continue as usual, sewing the waistband to the bodice then to the skirt. 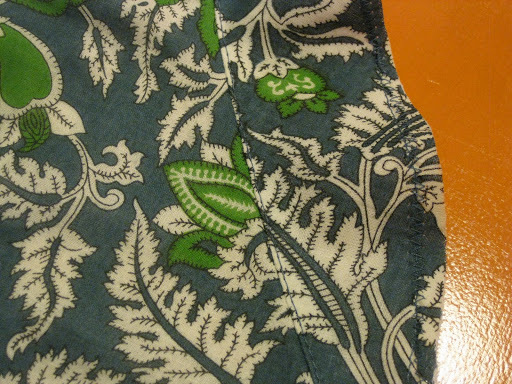 once sewn press the seams in toward the waistband and let the piping turn up toward the bodice and down toward the skirt. that’s it! 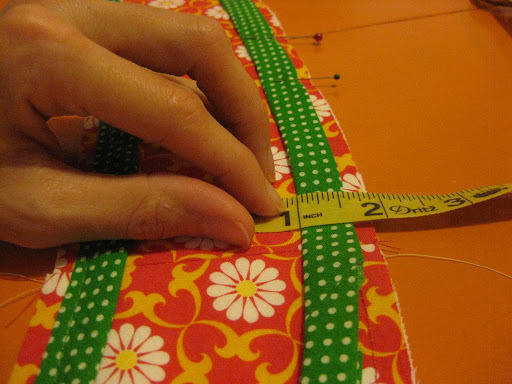 if you measure first (and can sew reasonably straight…) this is a super easy embellishment to do. the bias-bound edges are slightly trickier. now, i hear there are fabulous presser feet that fold and bind the tape as you sew. i don’t have this fancy little contraption so i have to attach it in steps. 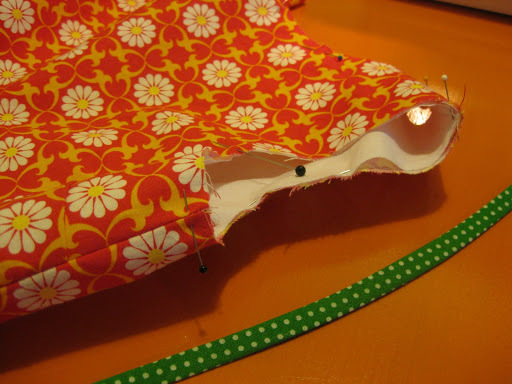 first, make sure the seam allowances are removed from the edge being bound. then i find it easiest to attach the bias tape first by hand. with the edges lined up, use a running stitch to baste the bias tape along the edge, stitching slightly in from the crease of the tape. 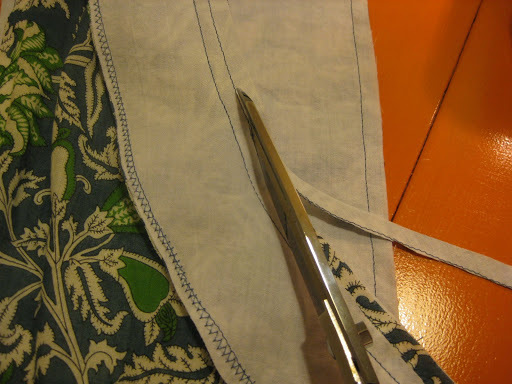 if you are working with a fairly straight edge you can do this with the sewing machine, but around small armholes i feel doing it by hand gives me greater control. once you have gone all the way around, fold the bias tape (i told you i was using double folded tape, right?) around the edge and pin it in place. 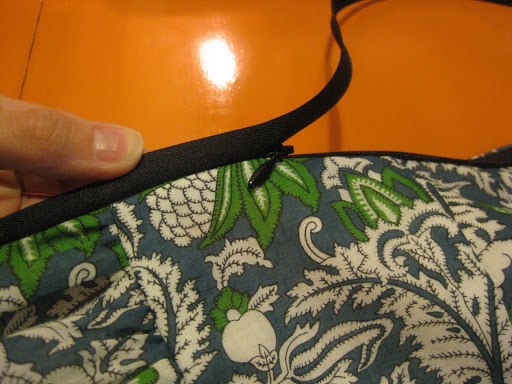 then, simply machine stitch close to the inner edge of the tape (on the outside of the garment). this should catch the tape you just folded to the inside of the garment. if for some reason your stitching falls off this inside edge, just hand stitch it in place later. it happens, no biggie. 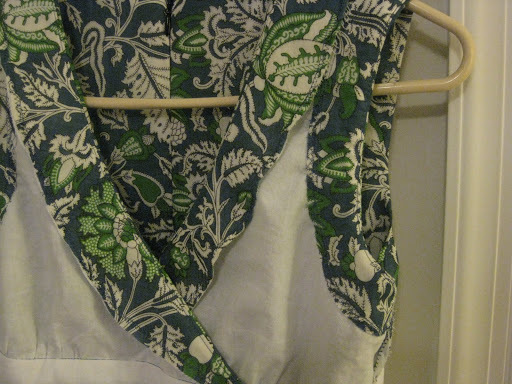 i also did this earlier on the skirt pockets before attaching the waistband to the skirt, by the way. i think the edges finished this way are just adorable plus it emphasizes all the seam lines that would have gotten lost in the fabric print. i want to insert the zipper before i bind the neckline edge, then all i have left to do is the hem! now, don’t save the bias tape for the kidswear only, that’s just what i happened to be working on at the moment. it’s great for a pencil skirt or really any time you want to add a little definition to your work. i don’t know which is more disturbing… finding a super moldy and gross loaf of forgotten bread in the back of the pantry or finding one that should be super moldy and gross because you realize it’s been months since you bought it. what do they put in that stuff to keep it from molding for soooooo long??? i have no idea, but every time this happens to me it reminds me that i love baking fresh bread that (if somehow forgotten) will begin to mold within 4-5 days. but it never lasts that long. after tweaking and taking what i like from one recipe to the next, here’s what i’ve come up with for my favorite dough recipe. it works well formed into hamburger buns (or occasionally hot dog buns) but today i’m baking them in a pan as dinner rolls. 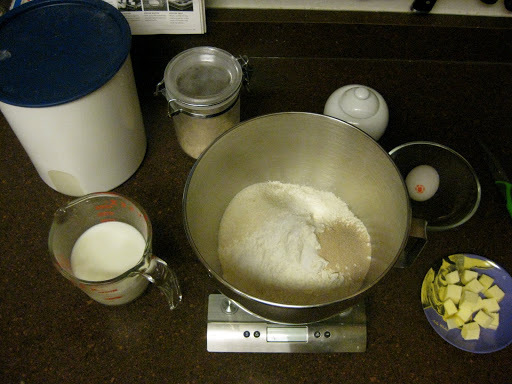 in your standing mixer bowl, whisk together flour, yeast, sugar and salt. 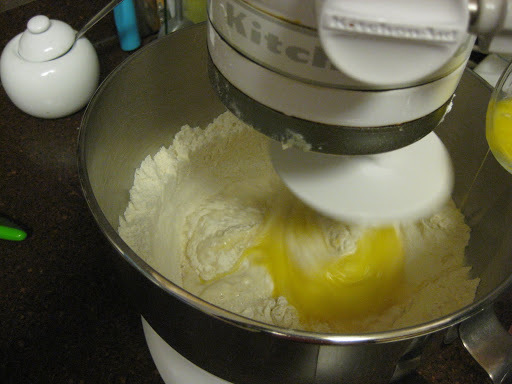 then, with the mixer running add the milk and egg. 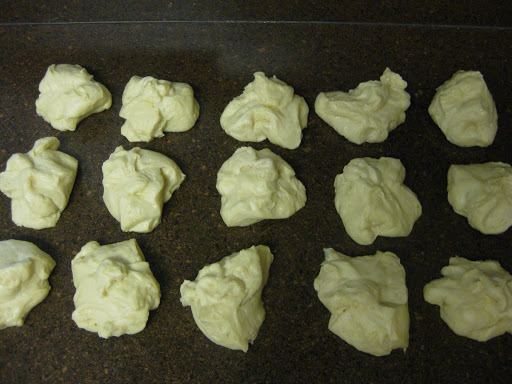 once it looks like this, add the softened butter. turn the mixer up to medium speed and let it go for about 8-10 minutes. this dough will start off very loose. you may be tempted to add extra flour. don’t. it will be fine. if it doesn’t look like this… keep mixing! now, turn the dough out onto the counter top. drizzle a little bit of oil in the mixing bowl (no need to wash out the bowl first, mom). the dough will still be sticky but there is no need for extra flour on the counter. in fact, the tackiness will help you form the dough into a smooth ball. 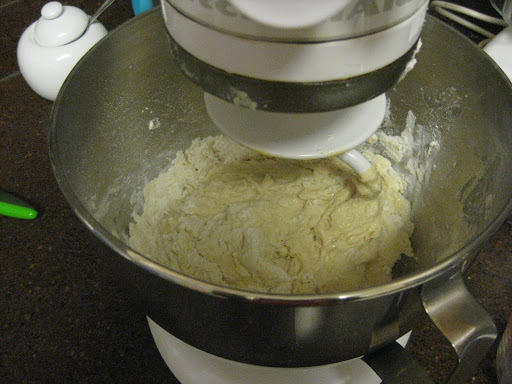 do this by passing dough from hand to hand and spinning the dough as you do so. 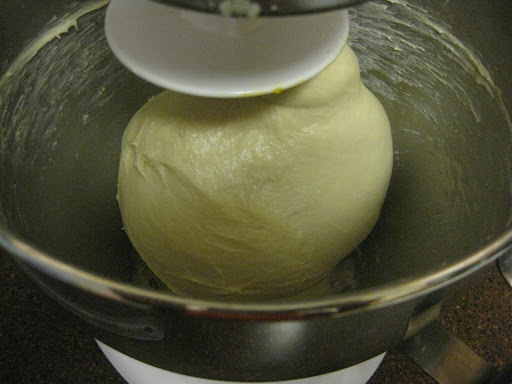 it will be a little messy at first, just move the dough around to pick up whatever has broken free from your hands. 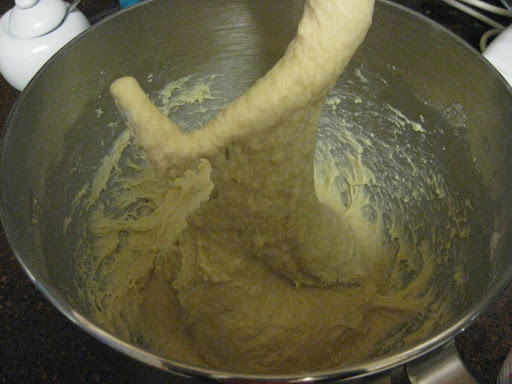 what you are doing here is tightening up the surface of the dough to trap in the gas released by the yeast. a tighter skin will give you a better rise to your dough. okay, cover and let it rise for about 1 1/2 hours. now, scrape out the dough onto the counter top. again, it’s going to be a little sticky. that’s okay. no extra flour needed. portion this into 15 little balls of dough. this is where a scale really comes in handy. if you have one, they will be 2 1/4 oz each. 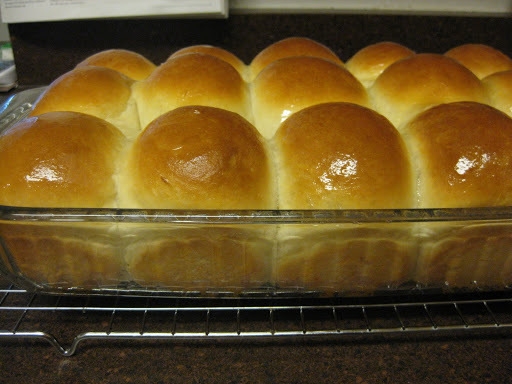 once you have all your little dough balls, take one at a time to roll it smooth. 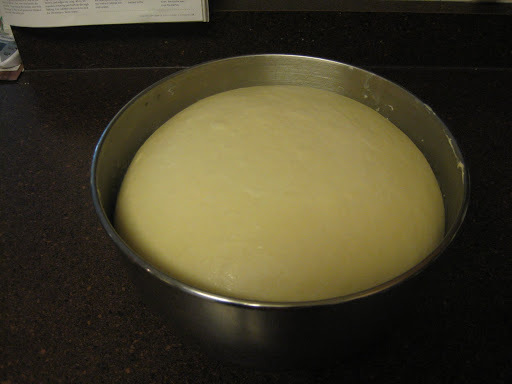 to do this, cup your hand over the dough and rotate it in a circle until the surface is taut. just like before, only mini! 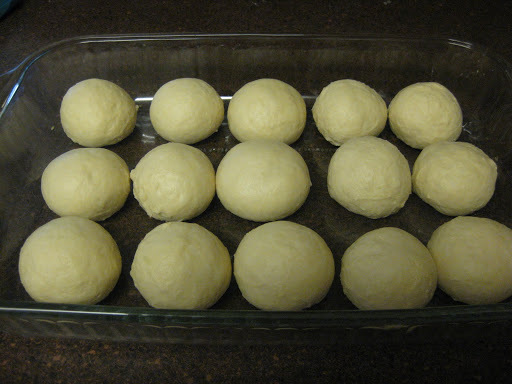 put the dough balls evenly spaced in a glass baking dish. 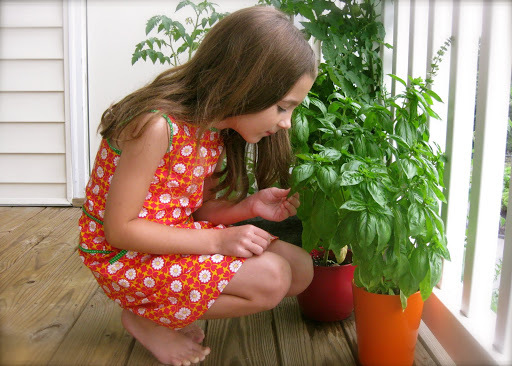 brush the tops with vegetable or canola oil (don’t use butter here, it burns too quickly. there will be butter later. i promise.) and cover with plastic wrap. let rise for 30-45 minutes. at some point here, heat up the oven to 350 F. your oven needs to be ready and waiting. you don’t want to end up with crazy frankendough (it’s alive!!!). it’s happened to me and it’s not pretty. 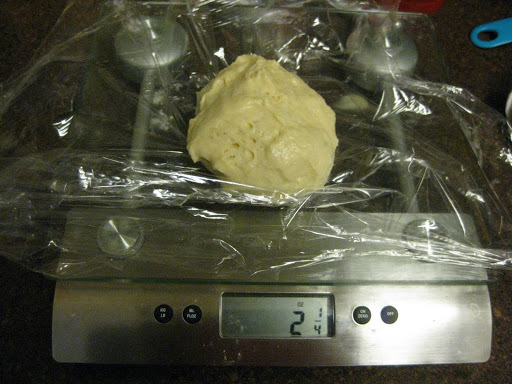 once the dough rises enough to just touch the plastic wrap, uncover and bake for 20 minutes, or until golden brown. once out of the oven, brush the tops with melted butter and let them rest at least 15 minutes before tearing them apart to serve. 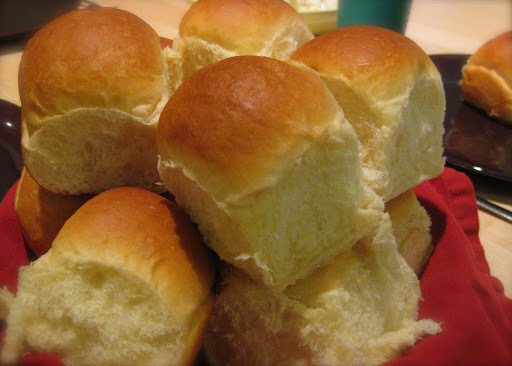 wouldn’t this lovely roll be right at home among some mashed potatoes and fried chicken? mmm… now you’re talking. comfort food at it’s finest. enjoy! p.s. to those who know what i’m talking about, these do taste like Darlene’s famous “hot rolls” from the school lunchroom—back when there were lunch ladies who actually cooked the school lunches. 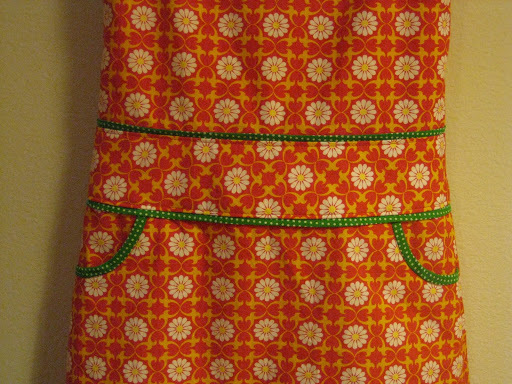 "garden party explosion" dress finished! 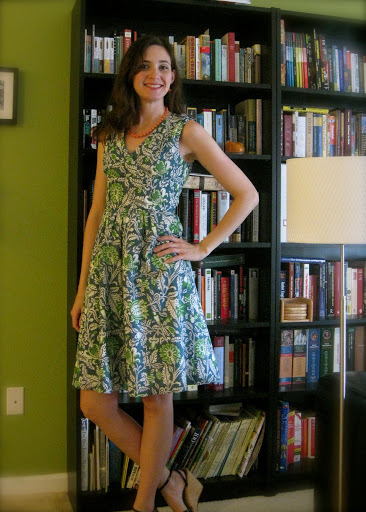 here is the finished “garden party explosion” dress! i’m super happy with this one. the fit is comfortable and flattering. i love how slimming it is. since the midriff hits just above my natural waistline it skims over all the bits that need skimming over. once the bodice and midriff were constructed i added a lining to the midriff first to make sure this area was stabilized and second to conceal some of the interior seams. to do this, i sewed the midriff pieces together at the side seams then pinned it to the seam allowance at the top of the midriff and sewed right over my first stitching. this is left free at the bottom edge and will be slip stitched in place later. next i pinned, gathered and attached the skirt to the midriff. 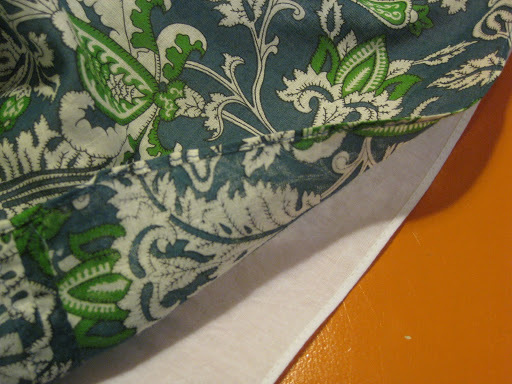 then i did the same with the lining right over (on the inside) the outer fabric. isn’t attaching the skirt to the bodice such a great moment? i love finally getting to see if my original vision will in any way resemble the almost finished product! isn’t this a lovely rolled hem? sooo glad i have a rolled hem presser foot! almost there! 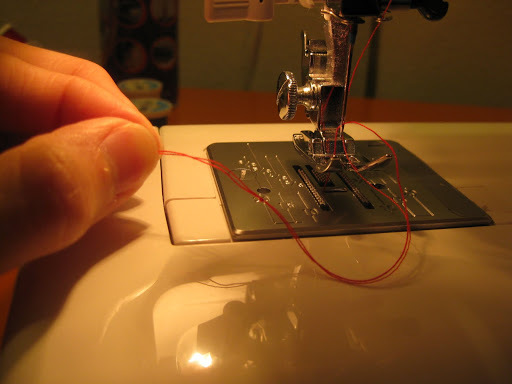 now it’s time to get out your hand stitching needle and thread. first i slip stitched the midriff to the skirt. it’s best to pin this before stitching to make sure it lays straight. once that was done, i pinned then catch stitched the armhole facings to the underlining. i used a catch stitch because it allows for a little bit of movement and it will keep any fraying of the facing edge in check. you can do the same to the neckline facing, but i simply tacked it in place at the shoulder and again halfway down the neckline. this facing doesn’t really have the tendency to flip up like the armhole facings do. 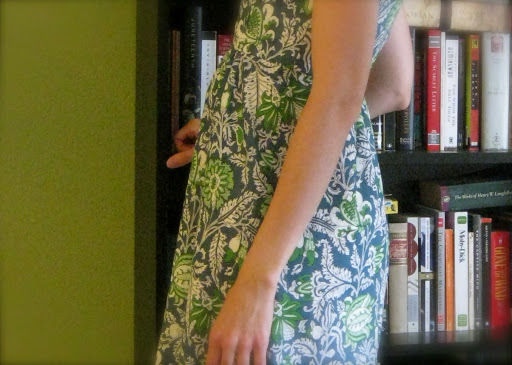 i am endlessly fascinated by garment construction, so here is the final dress… from the inside! oh, you want to see the outside again? zoom in! i have nothing to hide in this one! i did attach belt loops to the midriff before inserting the midriff lining, so now i’m on the hunt for the perfect skinny belt! or maybe make my own fabric-covered belt? hmmm… in the meantime i’ll wear it anyway since the belt loops are totally lost in this print. now i just need an invite to a garden party! 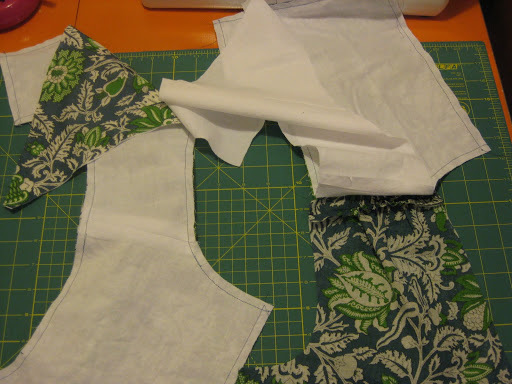 take the bodice pattern pieces and lay them on top of tracing paper, pattern paper, tissue paper, whatever you have on hand. then, decide how wide you want your facings to be. around the armholes i cut a 2″ facing which afterward i decided was a tad narrow, so when i cut the neckline facing i went with 2 1/2″. zipper will be for no specific reason other than i thought is would look nice. 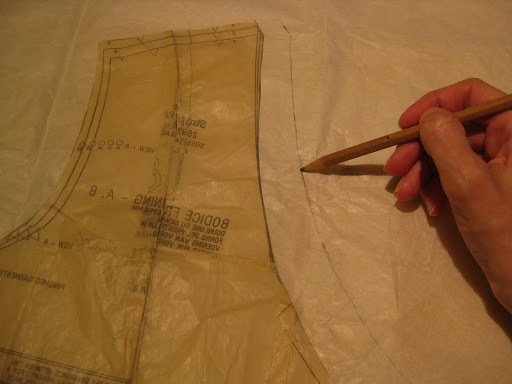 once you have constructed the bodice with your shoulder and side seams sewn (say that 10 times fast…) you will sew the two armhole facings together and the neckline facings together. it helps to include the little pattern markings at the seams when making the facing pieces so you can sew them together accurately. 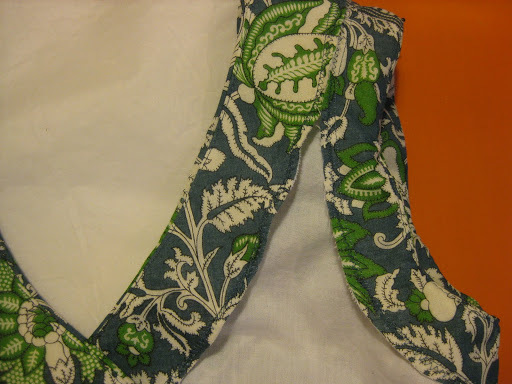 with the bodice turned to the right side, simply line up the edges of the armhole and neckline facings right sides together and stitch at 5/8″ (or whatever your seam allowance is). trimming the facing seam allowance by about half. once the seams are sewn and graded, press the facing up, then understitch. understitching insures that the facing won’t roll to the outside and it will give you a nice clean edge. the first time i used understitching i couldn’t believe what a difference it made! 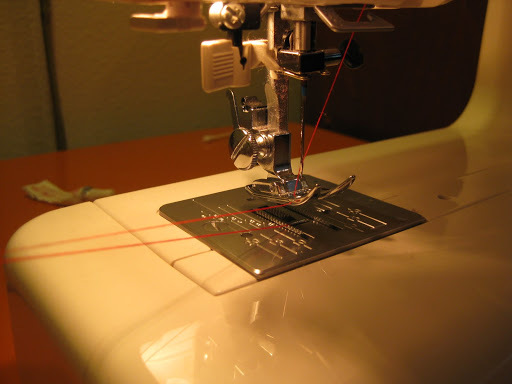 if you’re not familiar with how to do this, basically you pull the facing only over where you just stitched and press, then you stitch very close to the seamline through the facing and seam allowances. 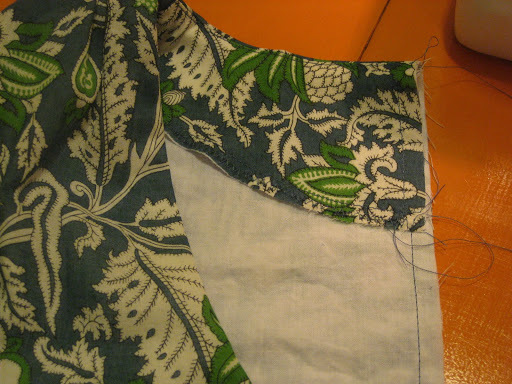 once you have understitched, turn the facing to the inside and press. 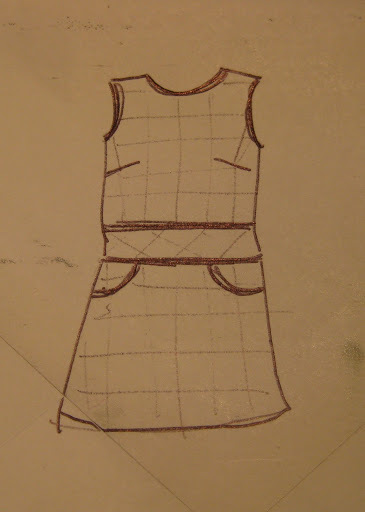 i have shown you pictures of the neckline, just treat the armholes in the same manner. 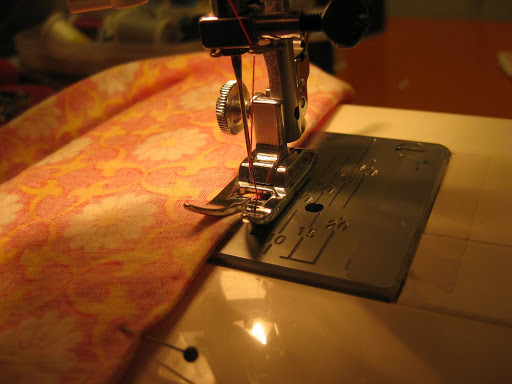 pin facing, stitch, grade seam, press, understitch, turn facing to the inside and press again. don’t be concerned if your facings flop around a bit as you work with the dress. once all the construction is done you will catch-stitch the facing to the interlining where necessary to secure the inside edge of the facing. 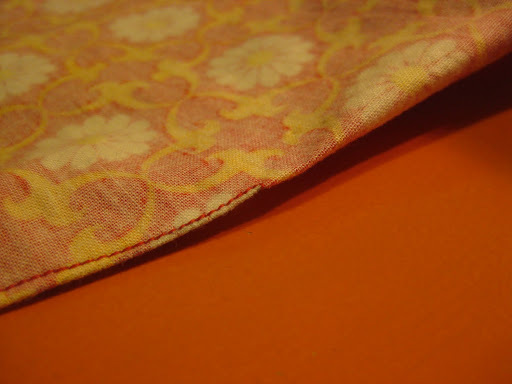 facings give such a clean and sturdy finish to these seams and prevent any of the lining from showing on the outside. i highly recommend trying this out! this is really the first time i have used this type of construction and i will definitely be using it again, especially at the armholes. i always hate it when the lining peeks out even if i’m the only one who notices! 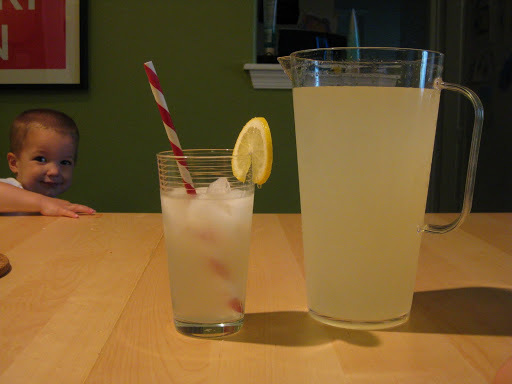 around our house, a 4th of july celebration is just not complete without lemonade. 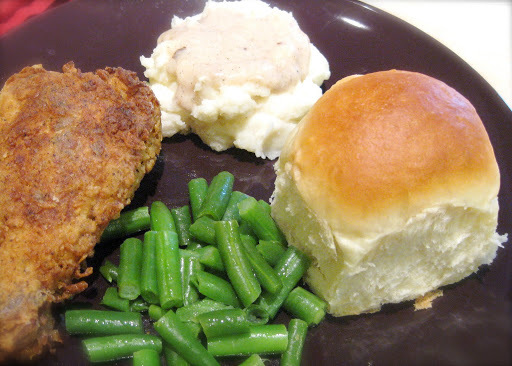 here’s a quick and easy recipe! 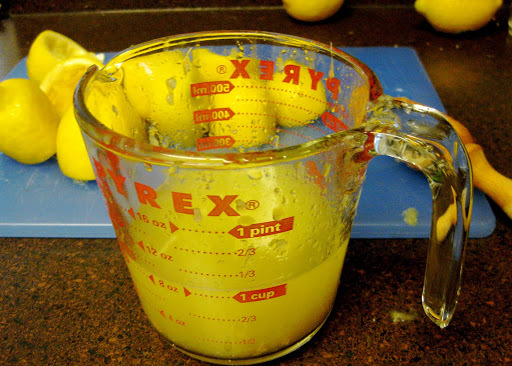 begin by making a simple syrup by combining the sugar with 1/2 c water over medium heat. once the sugar has dissolved, remove from heat. this could also be done in the microwave. 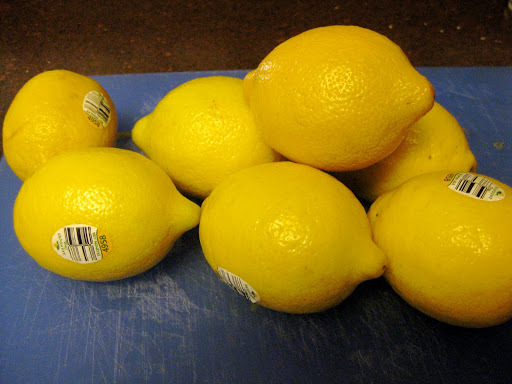 next, juice the lemons until you have 1 cup of lemon juice. 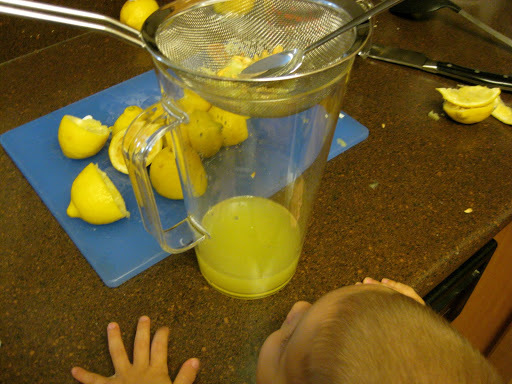 walk away from the pre-squeezed lemon juice in a bottle! just walk away!! i am in the “no pulp” category of humans, so i strain the juice. 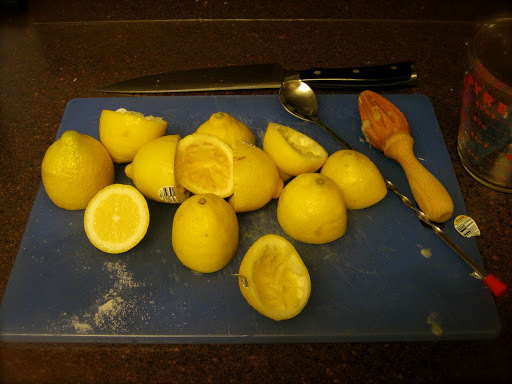 if you’re a pulpy kind of person just fish out the seeds. 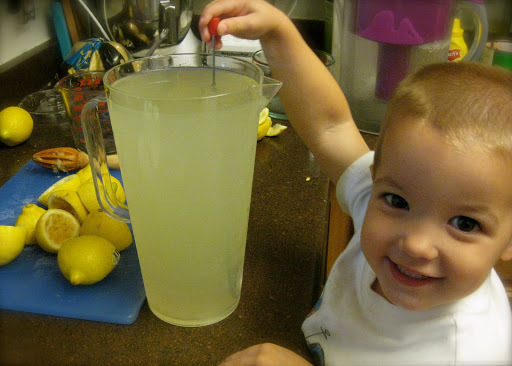 pour the juice along with 6 c of cold water and the sugar syrup into a pitcher and stir (this is where the cute 2 year old comes in handy). 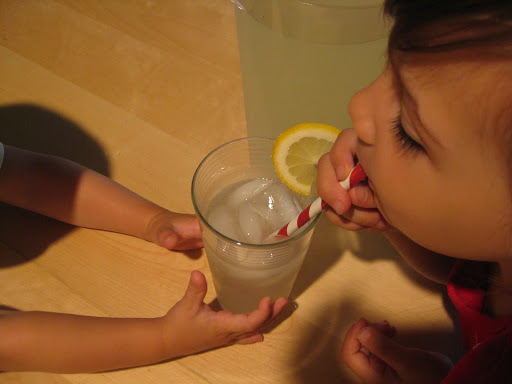 pour over ice and garnish with sugar-coated lemon slices. i finally got around to cutting my fabric for simplicity 2692! i am using a lightweight woven material and, having used similar fabrics recently, i know i will need to stabilize it somehow. i am a stickler for lining my dresses. i think the inside of a garment should be beautifully finished. yeah, i’m probably the only one who will see it, but who cares? interior finishes lend integrity to the structure and longevity of a garment. 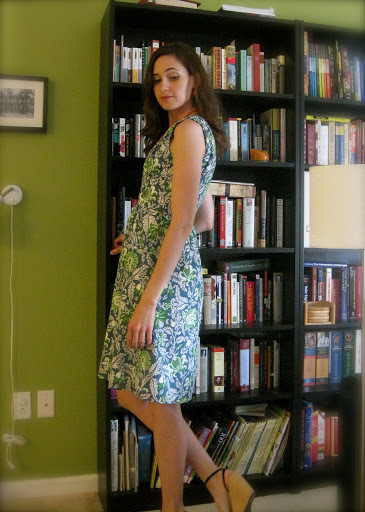 what use is making a dress if it’s all wonky and ill-fitting after only a couple wearings? 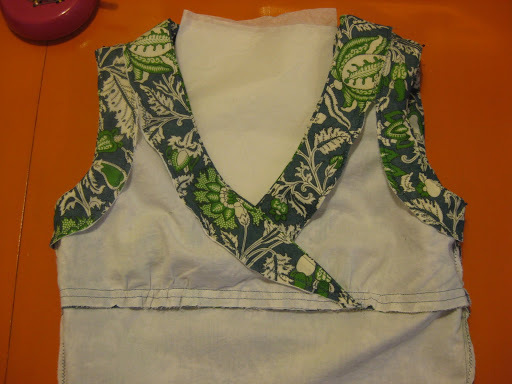 for this project i have decided to use underlining for the bodice, and facings around the armholes and neckline. 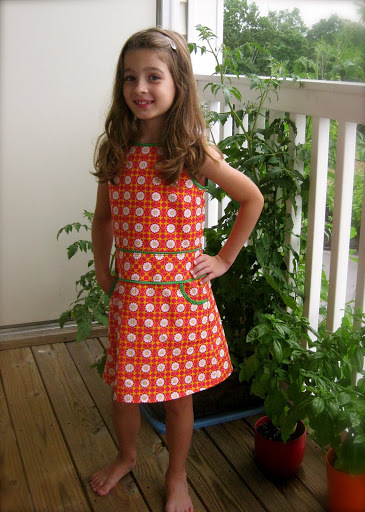 in the past i have used just a regular lining—basically a second dress stitched to the inside. for this particular fabric, that sort of lining won’t be enough. the material is loosely woven, almost gauzy. for added stability i need to underline all the bodice and midriff pieces. in various sewing books i’ve read about underlining but really just thought of it as an option and not so much a necessity. working with this particular fabric i realized that sometimes it really is necessary. okay, so what is underlining? 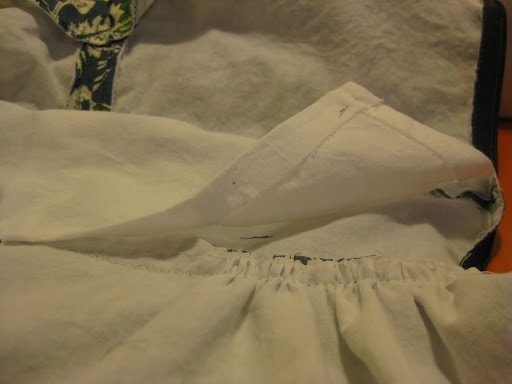 in short underlining is fabric sewn directly to the wrong side of the main fabric. 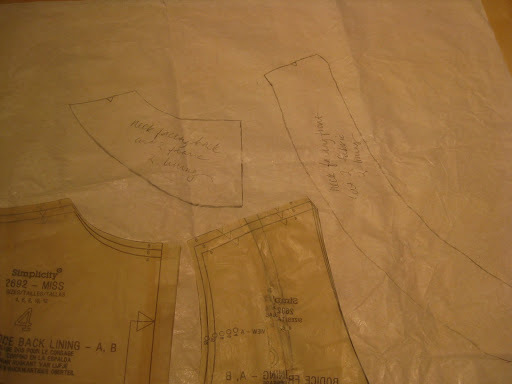 each piece is underlined individually before constructing any part of the garment. 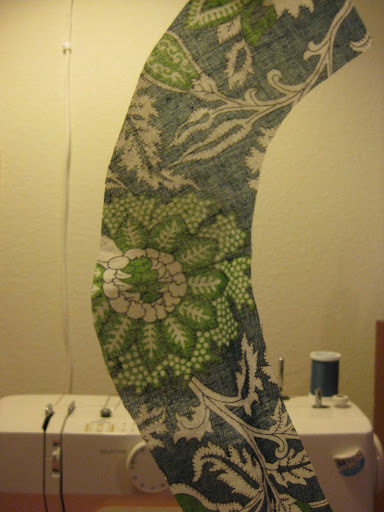 knowing how to do this gives you so much freedom in fabric choices. say you want a structured dress, skirt or even jacket but you fall in love with a lighter weight fabric? underline it! this is such an easy technique and one favored in higher quality garments. while i certainly don’t profess to know anything about couture finishes, i do know that underlining is one of them! have i convinced you yet? here’s how to do it! 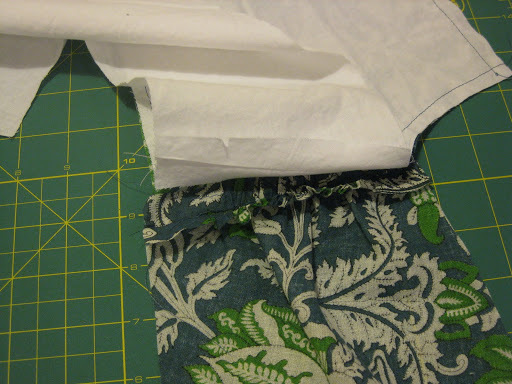 cut your main fabric then, using the same pattern pieces, cut your underlining. 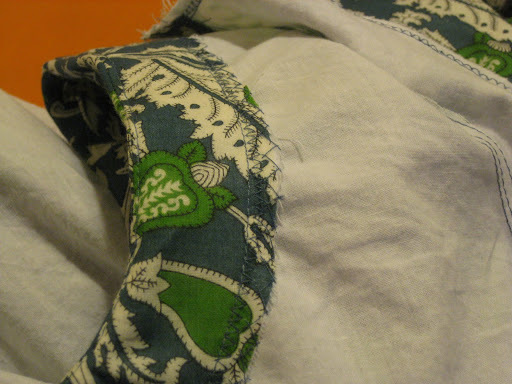 i am using muslin as my underlining because it is stable, easy to work with and it feels nice against your skin. 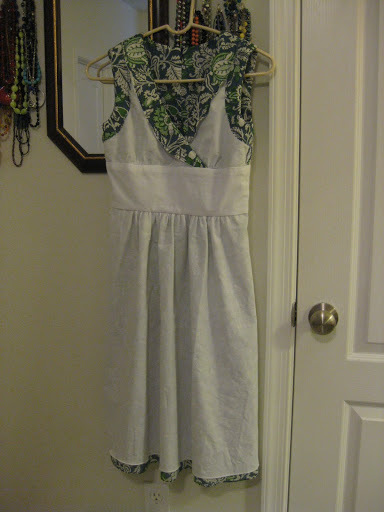 this is a dress that will be worn in the summer and i don’t want anything clingy or stifling! 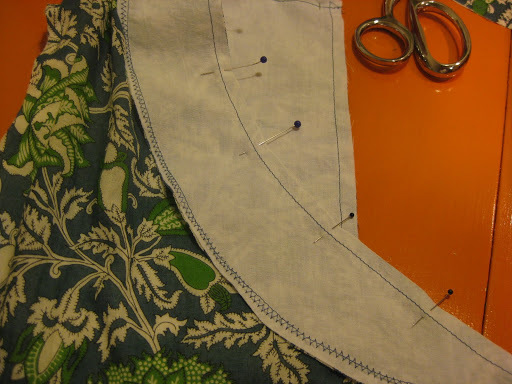 once cut, pin then sew each piece of underlining to the wrong side of it’s corresponding piece of fabric. the goal here is to have these two pieces act as one once sewn together, so care must be taken that there are no wrinkles or shifting. 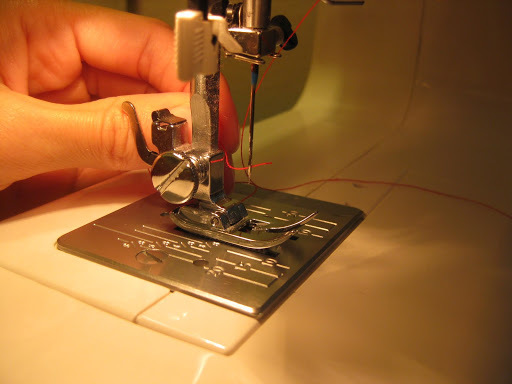 sew around the perimeter of each piece about 1/4″ from the edge (fyi: the distance between the needle and the right edge of the presser foot is usually 1/4″). very important tip: do not pivot at the corners!!! 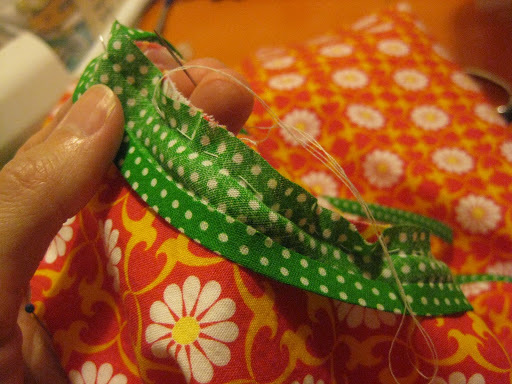 instead sew right off the edge then stop and move on the the next edge. this is to decrease the possibility of the fabrics shifting and ending up rippled. 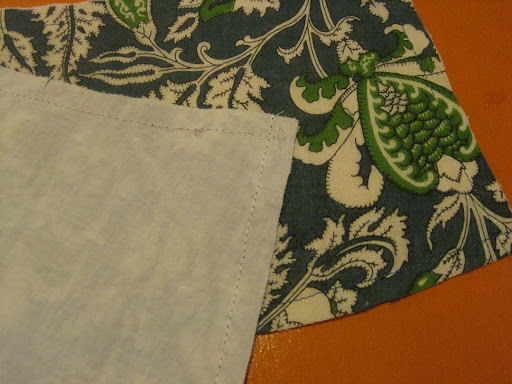 once the pieces are sewn together, give them a good steam press with your iron. 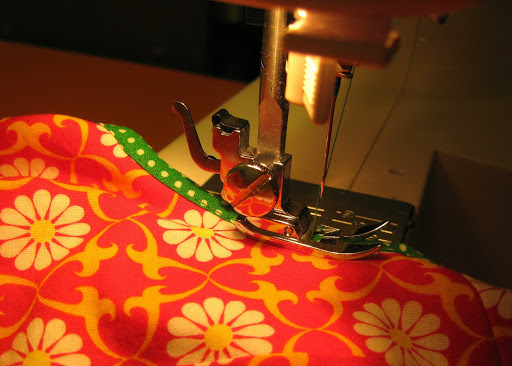 the iron is your best friend when sewing, don’t be lazy! if you get out your sewing machine, get out your iron too! see how sheer the fabric is on it’s own? see how much better the pattern stands out once underlined? okay, it’s hard to tell from these pictures… just trust me! also, i have to say, the underlined fabric just feels good. it’s stable, it won’t shift when you start to sew it all together, you just know it will be a high quality garment. so while i just got finished telling you that you must underline each piece individually before any garment construction takes place! i have one optional exception: where the bodice joins at the shoulder. 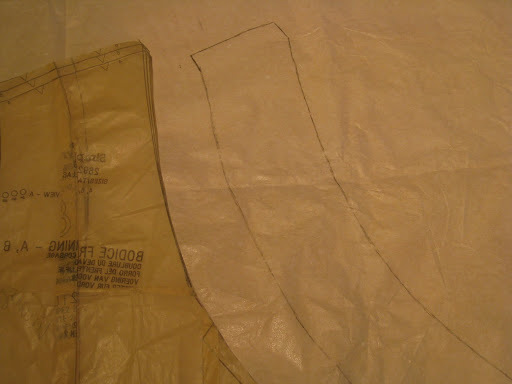 this particular pattern came with separate lining pieces because the outer fabric is gathered at the shoulders. to reduce bulk at this seam, i gathered the shoulder seams and sewed together the bodice front and back of the outer fabric and the underlining separately before applying the underlining to the outer fabric. i’m sure that made tons of sense… here’s a picture to show what i mean. i’m pretty sure this one little shortcut won’t ruin the dress. once your fabric is underlined you can decide whether to use facings, bias tape or a regular lining to finish off the edges. i will be using facings and show you how to make them in an upcoming post!